1. A set of stunning sandcast rings made with recycled metal that can even be personalized with the sand of your choice for a truly unique band. Get them from JustinDuance on Etsy for $853.99 (sizing made to order). 2. A sleek tungsten wedding band whose inner lining is made from a genuine white oak whisky barrel, for the couple who appreciate a fine aged spirit (and/or a very cool ring). Get it from RingsByPristine on Etsy for $360 (available in sizes 7-14.5 and in three widths). 3. A gold ring with pretty lace-design detailing that'll turn heads from now until forever. Get it from PreciousLaceJewelry on Etsy for $519+ (sizing made to order; available in 18k or 14k yellow gold, 14k rose gold, and 14k white gold). 4. A vintage-inspired 18K-gold band with scalloped diamonds as timeless as your love is. Get it from DanielCJewelry on Etsy for $420+ (sizing made to order; available in white gold, yellow gold, and rose gold). 5. A brushed-gold band that takes the classic ring up a notch with some subtle detailing. Get it from Spexon on Etsy for $579+ (sizing made to order; available in 14k rose gold, 14k white gold, 14k yellow gold, and palladium). 6. 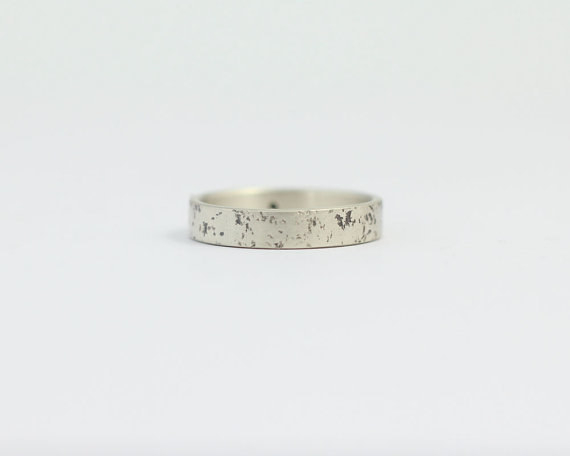 A distressed ring made using ethically sourced New Zealand gold or recycled silver, for the eco-friendly couple with amazing taste. Add additional ethical diamonds or colored gems for $50 per stone. Get it from Ash Hilton on Etsy for $190+ (sizing made to order; available in white gold, platinum, palladium, and silver). 7. A set of hammered sterling silver and recycled 14K yellow gold rings that'll have literally everyone asking, "Where'd you get those?" Get them from Specimental on Etsy for $1,040 (sizing made to order). 8. A sweet gold band for the person who's never going to leaf you. Get it from doronmerav on Etsy for $255 (sizing made to order; available in yellow gold, white gold, and rose gold). 9. A classy gold ring that puts a subtle ~twist~ on the traditional wedding band. Get it from Minimal VS on Etsy for $800+ (available in sizes 3 1/2–8 and in six finishes). 10. A classic band with the option of a matte finish for the to-be-wedded couple with minimalist style. Get it from Porana on Etsy for $414+ (sizing made to order; available in 14K or 18K solid white gold, rose gold, or yellow gold, or in platinum). 11. A two-toned wedding band that can be customized to any gold color combination, for the pair who know that two golds are always better than one. Get it from doronmerav on Etsy for $540+ (sizing made to order; available in rose gold, white gold, and yellow gold combinations). 12. A charming vintage-style silver band that'll have you saying, "Diamonds? I don't know her." Get it from WeddingRingsStore on Etsy for $85 (available in sizes 4-13). Get it from MinimalVS on Etsy for $480+ (sizing made to order; available in 14k or 18k white gold, rose gold, and yellow gold, and in platinum). 14. Quite possibly the cutest diamond engagement ring and wedding band set that this planet has to offer. The rings are made using ethically sourced New Zealand gold or recycled silver and conflict-free diamonds. Get it from Ash Hilton on Etsy for $390+ (sizing is made to order; available in six finishes). 15. An ultra-thin full-eternity wedding band glistening with diamonds, for the person who loves their bling but appreciates a delicate design. Get it from Milegem on Etsy for $279+ (available in sizes 4-13 and in 14k or 18k white gold, rose gold, and yellow gold). 16. A dazzling half-eternity diamond ring that's the literal definition of elegance. Get it from DiamondFineJewelry on Etsy for $355.50. 17. A set of beautiful bespoke wedding rings crafted from fair-mined, eco-responsible gold, for the couple whose love for the earth is just as real as their love for each other. Get them from EthicaljewelryEB on Etsy for $1,026.51+ (sizing made to order; available in 14K or 18K rose gold, yellow gold, and red gold, and 18K white gold). 18. A pair of striking Gibeon meteorite gold and titanium wedding bands, so you'll have a ring that's just as unique as your relationship is. Get them from JewelrybyFordos on Etsy for $1,573.66. 19. A super-quaint branch ring for the nature-loving pair who are ready to put down some roots. Get it from doronmerav on Etsy for $450. 20. A titanium and rose-gold ring that's as debonair as they come. Get it from Spexton on Etsy for $429. 21. A classic wedding-ring set made with recycled gold, so your "something old" is covered in the most gorgeous way. Get them from WeddingRingsStore on Etsy for $630 (sizing made to order; available in white gold, yellow gold, and rose gold). 22. A head-turning diamond nesting ring that'll be the perfect complement to your engagement ring. Get it from LaBoutiqueByJulia on Etsy for $365. 23. A breathtaking twisted band with black and white diamonds, because you're a little extra and you know you shouldn't have to choose just one for your wedding ring. Get it from HYDRAjw on Etsy for $764+ (sizing made to order; available in 14k or 18k rose gold, yellow gold, and white gold). 24. A set of minimalist bands in yellow gold and white gold so chic you'll never want to take them off. Get it from Follies Jewels on Etsy for $685. 25. A geometric textured band as unique as the ~shape~ of your love is. 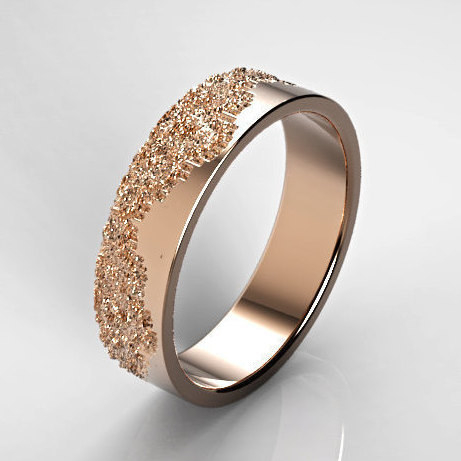 Get it from dorormerav on Etsy for $490 (sizing made to order; available in rose gold, yellow gold, and white gold). 26. A diamond eternity ring set with the gemstone of your choice — because life is short and you might as well rock a vibrant ring on your finger forever! The ring can be made with amethyst, turquoise, pearl, ruby, emerald, blue sapphire, pink sapphire, black diamonds, champagne diamonds, blue diamonds, aquamarine, or opal gemstones. Get it from MinimalVS on Etsy for $1,590 (sizing made to order; available in 18k rose gold, yellow gold, and white gold). 27. A handsome and rustic-looking hammered titanium band with a wooden inner that's a wonderful choice for outdoorsy types. Get it from GrandJunctionGuy on Etsy for $295 (sizing made to order). 28. An Art Deco-esque titanium ring with rose gold and silver detailing for the person who has your (he)art. Get it from Spexton on Etsy for $649 (available in sizes 3-20 and in four widths). 29. 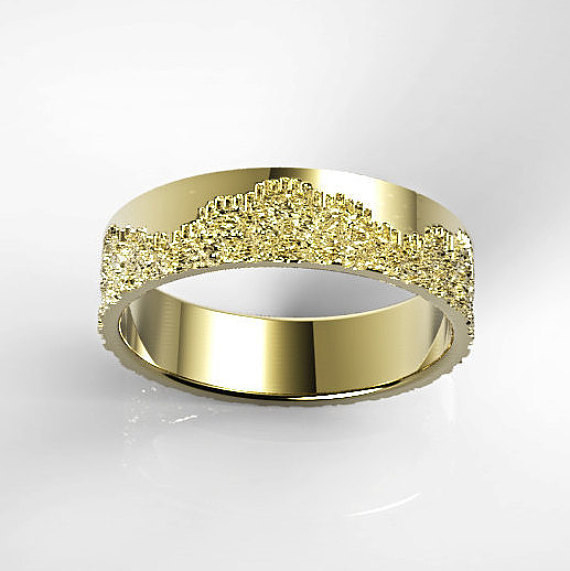 A sophisticated and modern gold band with textured detailing that gives it subtle little something special. Get it from GuyCohenJewelry on Etsy for $187+ (sizing made to order; available in 14k or 18k rose gold, white gold, and yellow gold). 30. A set of simple two-toned rings made with 18k gold and sterling silver, for the yin to your yang. Get them from Folliesjewels on Etsy for $445 (sizing made to order; available in three finishes). 31. A rose-gold five-petal flower ring to represent a love that's eternally in bloom. Get it from DesignMasters on Etsy for $899 (available in sizes 4.5-9). Get it from NyFineJewelry on Etsy for $255+ (available in sizes 3-9¾ and in 14k rose gold, yellow gold, and white gold). 33. 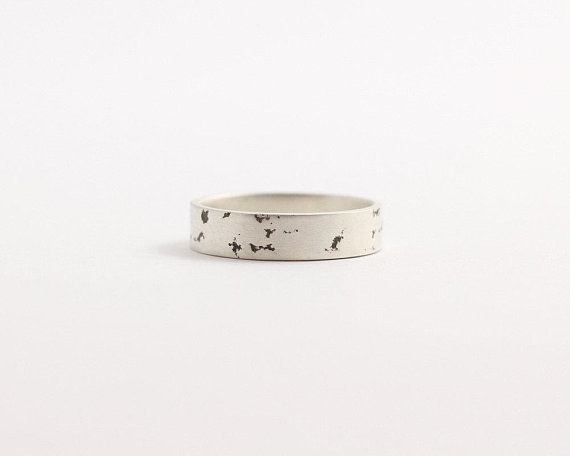 An edgy wedding band for the particularly bold nonconformist (or the proud Misfits fan). Get it from DesignMasters on Etsy for $1,649. 34. And a pair of whimsical, marvelous rings for travelers perfect for the couple who's about to say "I do (want to explore the world with you forever)." Get them from JewelryEscorial on Etsy for $740 (sizing made to order; available in 14k white gold, yellow gold, and rose gold).